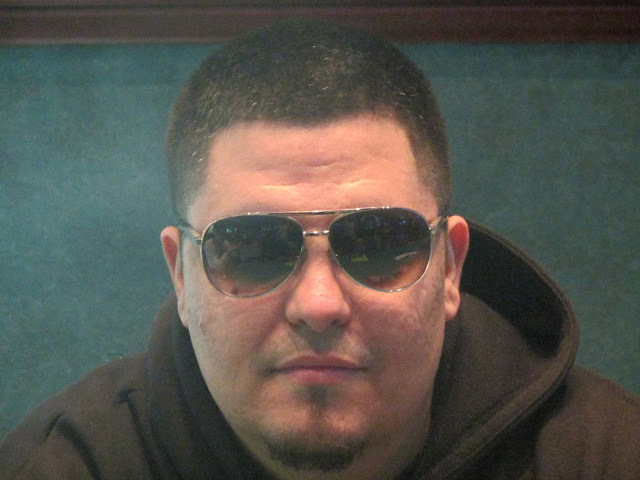 Felipe Villagran moved all in from the button and Glenn McCaffrey instacalled, showing [Ts][Td]. Felipe would need some help as he held [Ad][7h]. Things got worse for Felipe as the flop fell [Th][7c][6c], and the [Kh] on the turn left Felipe drawing dead. The meaningless [4c] fell on the river, and Felipe earned $11,325 for 2nd place. Glenn McCaffrey will earn $20,348 for his 1st place finish, as well as the title and the trophy. On the river with the board reading [Jd][2s][7c][Js][As], Dan Chan moved all in and was instacalled by Glenn McCaffrey, who exposed the [Ad][Jh]. 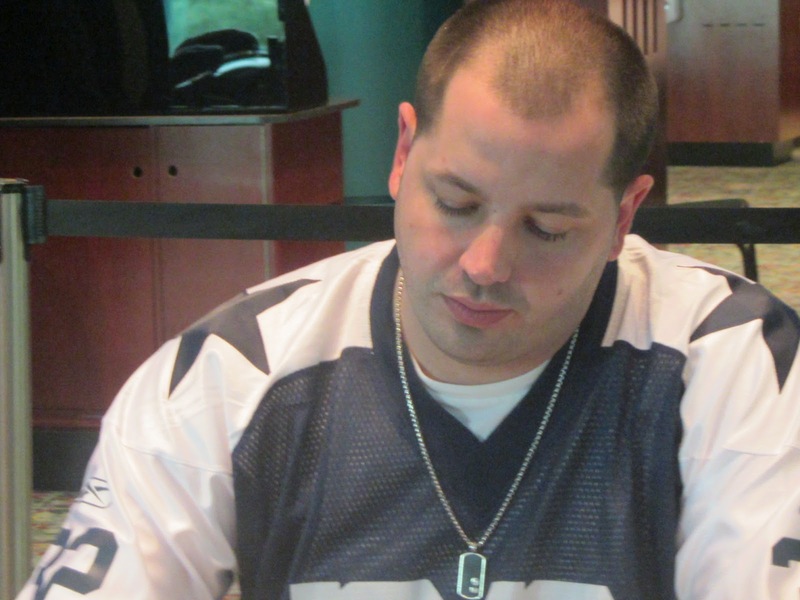 Dan took a look back at his cards and mucked, eliminating him from the tournament. 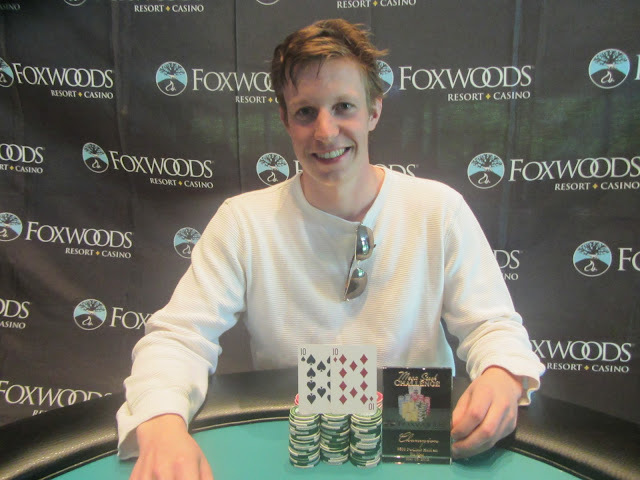 He will earn $7,872 for his 3rd place finish. On the first hand back from break, Glenn McCaffrey folded the button, and Felipe Villagran moved all in from the small blind. 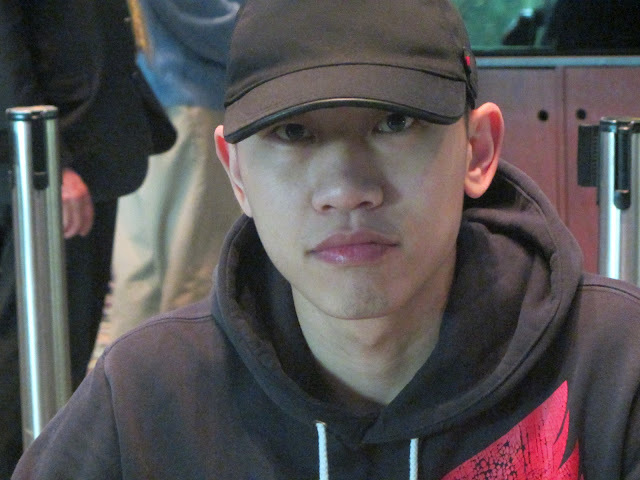 Dan Chan called all in from the big blind and showed the [Ah][Th], which was in a race against Felipe's [9h][9c]. Dan flopped two pair on the [Ad][Tc][4d] flop, and the two pair held up through the [3c] turn and the [Qc] river. Dan has doubled up to approximately 700,000 while Felipe still over 1.2 million. Players are on a brief 5 minute minute break while the tournament staff colors up and races off the 1,000 chips. When the players return, they will be playing 15,000/30,000 blinds with a 5,000 ante. Action folded to Dan Chan in the small blind, who moved all in having David Grandieri covered. David called and was way ahead with his A-9 against Dan's A-2. David kept his lead by flopping a nine, leaving Dan drawing to runner runner flush. The turn was the [9s], giving Dan his backdoor flush draw. Unfortunately for David, the river brought a spade, and Dan won the pot with his [As]. David will earn $5,489 for his 4th place finish. 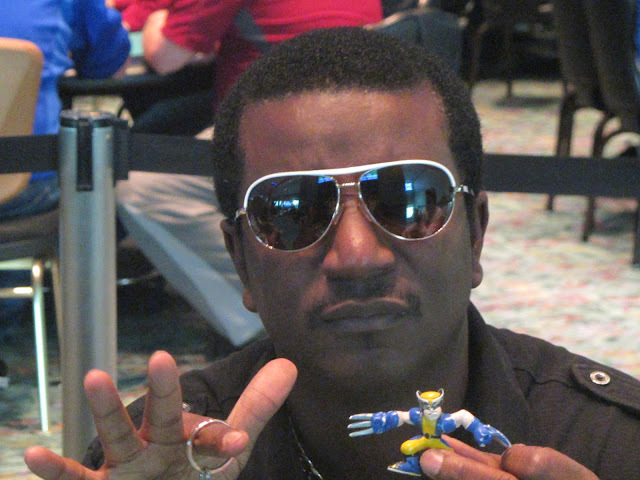 Sherwin Agard pushed all in from the button with A-9 and was called by Felipe Villagran in the big blind with pocket jacks. 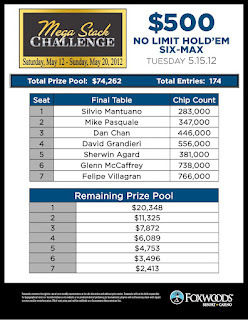 Sherwin failed to improve his hand, and he will exit the tournament in 5th place, good for $5,343. The 5 remaining players are now on a 10 minute break. When they return, they will be playing 12,000/24,000 with a 4,000 ante. On the river, with the board reading [As][5h][Kd][3d][4c], Mike Pasquale checked to Felipe Villagran who moved all in. Mike made the call, and Felipe showed him [Ad][Qs]. 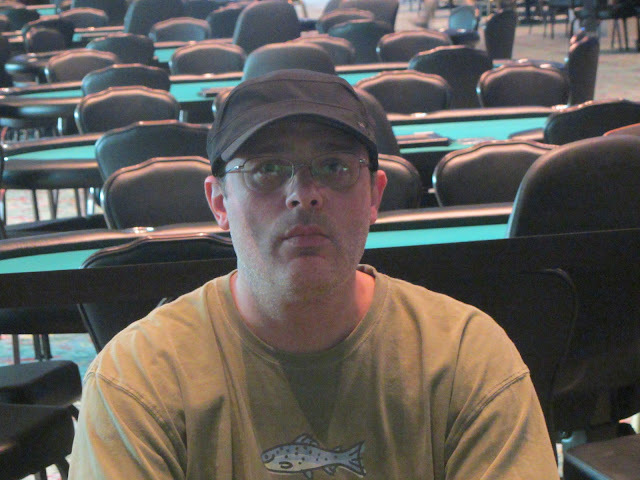 Mike mucked, and without much drama, he will head to the cage to collect $3,496 for his 6th place finish. Silvio Mantuano raised preflop and was reraised all in by Mike Pasquale. Silvio eventually made the call holding K-Q and was in a race against Mike's pocket eights. 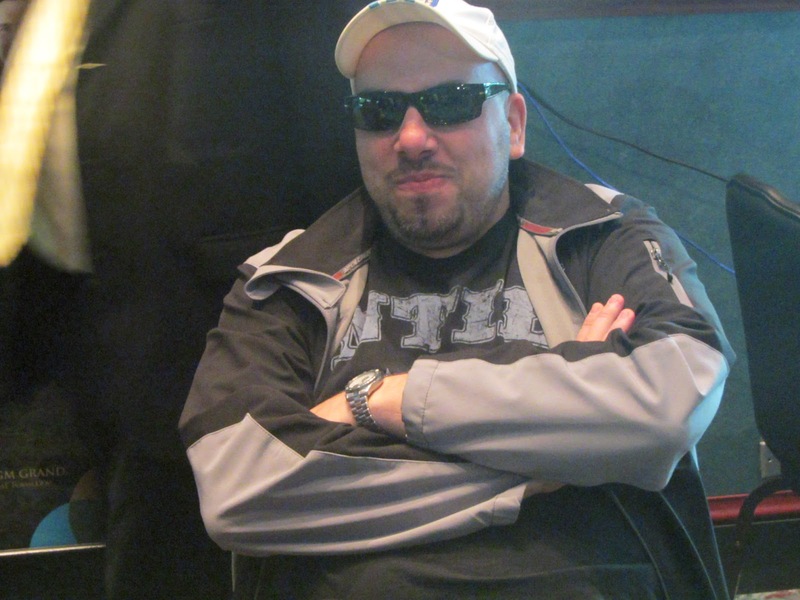 An eight on the flopped sealed the deal, and Silvio was heading to the rail. However, after the dealer counted down Mike's stack, it was discovered that Silvio had one ante chip left. He put that ante chip in the next hand and won with A-5 vs Mike's K-Q. Unfortunately Silvio did not win the third hand, as he put his 6 chips in with 9-4 and lost to T-5. 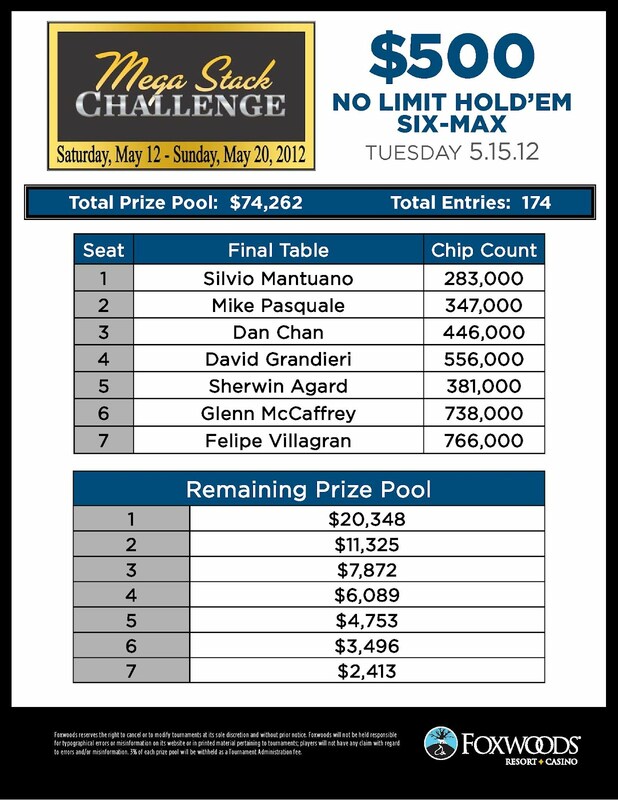 Silvio will earn $2,413 for his 7th place finish. The final 7 players in the $500 Six Handed have taken their seats and cards are in the air. There is still 37 minutes and 32 seconds left in the 6,000/12,000 blinds. After some discussion about playing the event out tonight, the final 7 players decided to keep the tournament a two day structure. They will return at 1pm EST to play down to a winner. Seating assignments and chip counts will be posted shortly. It's been two levels since we lost our 10th place finisher, and though we've seen a few all ins since, the short stack has always won. Earlier, players were hoping to finish the tournament tonight rather than come back tomorrow, but since the tournament is stuck at 9 players, that seems unlikely. On the bright side, the field did make a pay jump from $1,708 to $2,413 when they lost the 10th place finisher.